The aim of this work is to incorporate cooperativity into Huxley-type cross-bridge model in thermodynamically consistent way. While the Huxley-type models assume that cross-bridges act independently from each other, we take into account that each cross-bridge is influenced by its neighbors and cooperativity is induced by tropomyosin movement. 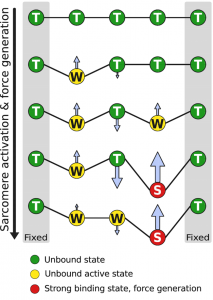 For that, we introduce ensembles of cross-bridge groups connected by elastic tropomyosin. 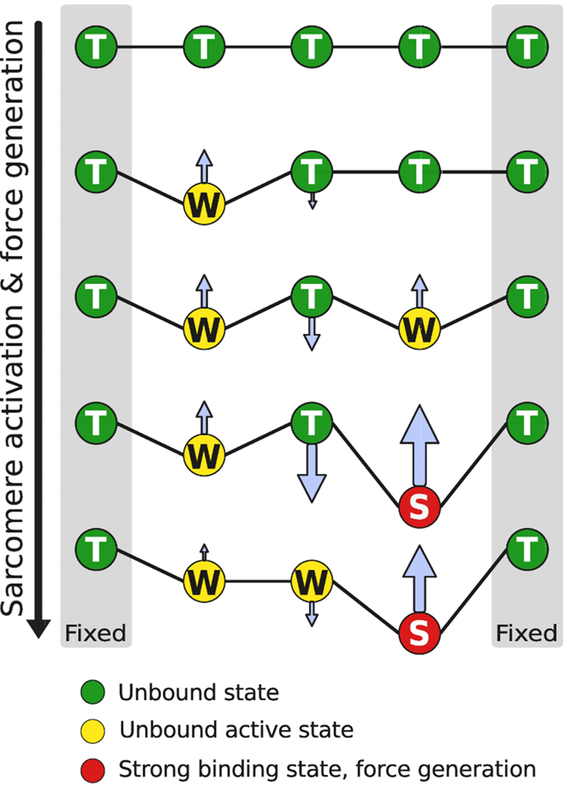 By taking into account that the mechanical displacement of tropomyosin induces free energy change of the cross-bridge group ensemble, we develop the formalism for thermodynamically consistent description of the cooperativity in muscle contraction. An example model was composed to test the approach. The model parameters were found by optimization from the linear relation between oxygen consumption and stress-strain area as well as experimentally measured stress dynamics of rat trabecula. We have found a good agreement between the optimized model solution and experimental data. Simulations also showed that it is possible to study cooperativity with the approach developed in this work.